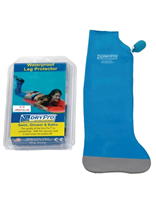 Completely waterproof patented protection for above-the-knee casts and wounds. Comes with pump to create a vacuum-seal. Bathe, shower, or even swim without worry of infection or damage to your cast or other arm or leg wound. The special non-skid grid protects the sole and helps prevent slipping. The Dry Pro waterproof cast cover. Swim, shower or bathe with a cast, bandage or wound. The Dry Pro waterproof cast cover and bandage protector is completely watertight and waterproof for underwater activities. 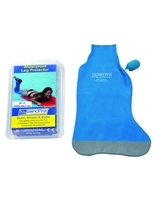 Cast cover is for use with a broken leg, Diabetic Ulcers or other Bandages.